Many managers are good at what they do. But they want to be better leaders. They want to be more authentic, more inspiring, igniting passion and loyalty from the team around them. These managers often want to take their careers to the next level. We ask these folks to consider taking the Leading with Emotional Intelligence Course. This course is designed for managers that realise the need to develop their leadership skills to take their career to the next level and also realise the need to develop their leadership skills for greater organisational effectiveness. In the 21st century a large part of leadership, according to several leading leadership frameworks, is dependent on emotional intelligence skills. This skill-set is developed through assessment, coaching, and training and begins by measuring one's Emotional Quotient (EQ). All the leading business schools in the world teach a course on leadership and emotional intelligence, e.g. Insead, Harvard, Stanford Graduate School of Business, etc. (incidently, EITC has trained and certified all the coaches that coach graduate students at the Stanford Graduate School of Business). The Leading with Emotional Intelligence Course is very interactive with a lot of discussion, learning games, case study analysis, actual workplace examples, learning activities, self-reflection, and planning to apply the learning. This course is appropriate to managers at all levels within organisations. Class sizes iskept small with the ideal size of 10 14 participants, so you can expect some in-depth discussions about leadership issues with your peers. Assessment and coaching are important parts of any leadership development course and we use the Emotional Quotient Inventory (EQ-i2.0®) AND the EQ360®, which allows for the comparison of your own assessment of your EQ against ratings from your manager, peers, direct reports, and friends/family. 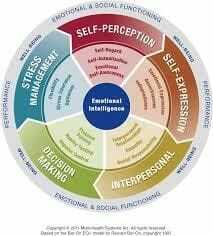 These are currently the world's leading measures of emotional intelligence skills. The [EQ-I]/EQ360® are online assessments that are arranged prior to the course. Each participant will receive a one-one telephone debrief session prior to the course and then two subsequent coaching sessions with one of our qualified EQ coaches.